Andy Stanley, like Marcion of old, rejects Old Testament–but what did Jesus and the Apostles do? « BibleNewsProphecy: Record Heat: Is it Biblical? Mega-pastor Andy Stanley caught a lot of theological flak back in May for telling his congregation it was time for them to “unhitch” from the Old Testament. This weekend, however, Albert Mohler, president of the Southern Baptist Theological Seminary, hit back hard by comparing Stanley’s continuing controversial comments on the matter with an ancient heresy. “We are looking here at the ancient heresy of Marcion, who argued that the Old Testament must be repudiated by the church,” wrote Mohler. First, nearly all the references to “scriptures” (21 times in the NKJV) or “scripture” (30 times in the NKJV) in the New Testament are referring to the Old Testament portion of the Bible. The only reference that is not, 2 Peter 3:16, refers to Paul’s writings which were part of the New Testament. Hence, Andy Stanley is wrong about scriptures not meaning the Bible. Jesus is mentioned at least 20 times referring to the Old Testament as scriptures in the Gospels. By mentioning the term “canons,” the Harris Fragments seems to be suggesting that John passed the knowledge of the proper books of the Bible to Polycarp–and that would have been the case. The Church of God (which is NOT Protestant) had the full Bible by the end of the first century–it did NOT wait until the Roman Empire supposedly made Christianity legal (I say supposedly because Emperor Constantine changed the ‘legality’ to go against those he considered heretics). 16 All Scripture is given by inspiration of God, and is profitable for doctrine, for reproof, for correction, for instruction in righteousness, 17 That the man of God may be complete, thoroughly equipped for every good work (2 Timothy 3:16-17). The above included the Old Testament. Paul was writing to Timothy. At the time of Timothy’s childhood there was no New Testament. Hence, in order to be a COMPLETE “man of God” the Old Testament is needed according to what the Apostle Paul was inspired to write. Fourth, notice that in 2 Timothy 3:15 the Apostle Paul was writing that it was from the Old Testament that Timothy was able to learn about salvation through the Messiah Jesus. “I’m convinced that we make a better case for Jesus if we leave the Old Testament or the old covenant out of the argument … you don’t need ancient prophs when somebody rises from the dead” (Jonathan Merritt interview of Andy Stanley. Seekers & Speakers, podcast. August 9, 2018). By “prophs” he meant biblical prophecies from the Old Testament. That position is contrary to what Christians did. While everyone would not accept the biblical testimony, it was often used as proof by the early Christians. Philip also did this (Acts 8:32-35). Peter and Paul did NOT unhitch from the Old Testament, nor did James (cf. Acts 21), like Andy Stanley claimed. Jesus’ resurrection did not prevent them from using Old Testament prophecies–it was a factor that increased their interest in doing so. The way he would have proven that was to use prophetic scriptures in the Old Testament. By this time he realized that Jesus had been resurrected. The Bereans were using the Old Testament to do this. Furthermore, I should add that the New Testament shows that over 200 Old Testament statements and prophecies were fulfilled by Jesus. To see those, check out the free online book: Proof Jesus is the Messiah. “You are not accountable to the Ten Commandments, we’re done with that. 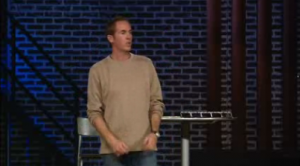 God has done something new.” (Jonathan Merritt interview of Andy Stanley. Seekers & Speakers, podcast. August 9, 2018). That would have been something the apostate Marcion would have supported–but not early Christians. But Polycarp also was not only instructed by apostles, and conversed with many who had seen Christ, but was also, by apostles in Asia, appointed bishop of the Church in Smyrna, whom I also saw in my early youth, for he tarried [on earth] a very long time, and, when a very old man, gloriously and most nobly suffering martyrdom, departed this life, having always taught the things which he had learned from the apostles, and which the Church has handed down, and which alone are true. To these things all the Asiatic Churches testify, as do also those men who have succeeded Polycarp down to the present time — a man who was of much greater weight, and a more stedfast witness of truth, than Valentinus, and Marcion, and the rest of the heretics. He it was who, coming to Rome in the time of Anicetus caused many to turn away from the aforesaid heretics to the Church of God, proclaiming that he had received this one and sole truth from the apostles — that, namely, which is handed down by the Church. There are also those who heard from him that John, the disciple of the Lord, going to bathe at Ephesus, and perceiving Cerinthus within, rushed out of the bath-house without bathing, exclaiming, “Let us fly, lest even the bath-house fall down, because Cerinthus, the enemy of the truth, is within.” And Polycarp himself replied to Marcion, who met him on one occasion, and said, “Dost thou know me?” “I do know thee, the first-born of Satan.” (Irenaeus. Adversus Haereses. Book III, Chapter 3, Verse 4. Excerpted from Ante-Nicene Fathers, Volume 1. Edited by Alexander Roberts & James Donaldson. American Edition, 1885). What were some of the doctrines of Marcion that Polycarp and Theophilus would have objected to? Seems to have been the first associated with Christianity to try to “do away” with the seventh day Sabbath. Seems to have been the first associated with Christianity to try to “do away” with the Ten Commandments. Seems to have been the first associated with Christianity to try to “do away” with the Old Testament. Seems to have been the first associated with Christianity to try to “do away” with the Millennium. Because of his radical approach, some Protestants have claimed that Marcion was the first Protestant–see Marcion: The First Protestant? — even though Protestants do not agree with all of Marcion’s doctrines. Here is a link to the sermon: Marcion: The first Protestant reformer? Oddly, though some Protestants have claimed Marcion, Marcion actually was part of the Church of Rome–even decades AFTER he was condemned by Polycarp of Smyrna. Rome tolerated Marcion for decades after Polycarp condemned him and eventually adopted several of his doctrines. Many Protestants accept at least part of Marcion’s position on the Ten Commandments. While there are Protestants that claim that the Ten Commandments are in effect, many disagree. Also, the Jehovah’s Witnesses teach Marcion’s errors related to the Ten Commandments and the Sabbath (for proof, check out the article Similarities and Differences Between the Jehovah’s Witnesses and the Continuing Church of God). It is sad that even today, people like Andy Stanley promote views held by apostates such as Marcion. UPDATE 08/19/18: We just uploaded a related video: Andy Stanley opposes prophesies of Jesus? Similarities and Differences Between the Jehovah’s Witnesses and the Continuing Church of God Both groups claim to represent the original Christian faith. Do you know much about them? Both groups have some interesting similarities, but many major differences. Would you like Christian answers for Jehovah’s Witnesses to give information on how to deal with Jehovah’s Witnesses? A related sermon is also available: Jehovah’s Witnesses: Right and Wrong Teachings? This entry was posted on Sunday, August 12th, 2018 at 7:45 am	and is filed under Church History, Doctrine, Religious News. Temple Institute: ‘Build for Me a Sanctuary’ and the ‘other 612 Torah commands’?